Silverwood is actually the largest theme park in the Pacific Northwest! 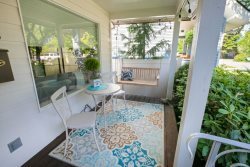 Located within just minutes of Coeur d’Alene. Silverwood Theme Park has more than 70 rides, slides, shows and attractions, including four roller coasters, Boulder Beach Water Park, a steam engine train, live entertainment scheduled multiple times during the season, several on-site restaurants, and more. Silverwood’s season runs May-September… then in October, things get a bit frightening as it morphs into Scarywood for the Halloween season, with rides, haunted attractions, “scare zones” and a whole lot of fun families that enjoy a good fright. Featuring several different themed escape rooms. Your team is locked in a away for one hour. Your mission is find the clues, solve the puzzles, and locate the key that will unlock the door before your time is up. A great outing whether you are looking to have some family fun, or hang out with a group of friends. Test your solving skills with different types of rooms all at different difficulty levels. Strike Zone is home to the most advanced Laser Tag experience in the northwest, and the only Dart Battle arena in the Spokane/Coeur d'Alene area! While your in town come have some fun you can't experience anywhere else. Whether its laser tag or an all out dart battle, Strike Zone is sure to be fun for the whole family.